This 110x165mm Flat Invitation Card is made from our stunning bright white stripe textured matte 216gsm card from the USA - Classique Stripe White which is double sided colour & texture. Direction of pattern is along the long edge of the 110x165mm Flat Invitation Card (runs accross the card when held in portrait format). 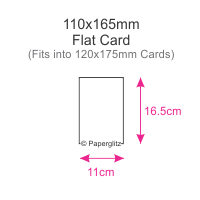 If you require the pattern to run in the same direction as the short edge of the unfolded card, we can provide by special request for additional charge. This 110x165mm Flat Invitation Card is made from paper that is manufactured in the USA and is converted & packaged by Paperglitz in Sydney, Australia. This is a premium range of papers that has for many years been a favourite for all wedding stationers. We also carry this colour in 118gsm paper, 216gsm card, boxes & a wide range of die cut DIY invitation cards.